In the series called “The ABCs of the Corcoran Artist Files” the American Art and Portrait Gallery (AA/PG) Library will explore artists through the materials from the recent Corcoran Vertical File Collection donation by featuring artists whose surnames begin with that letter. This time we are looking at the artists whose last names start with I. 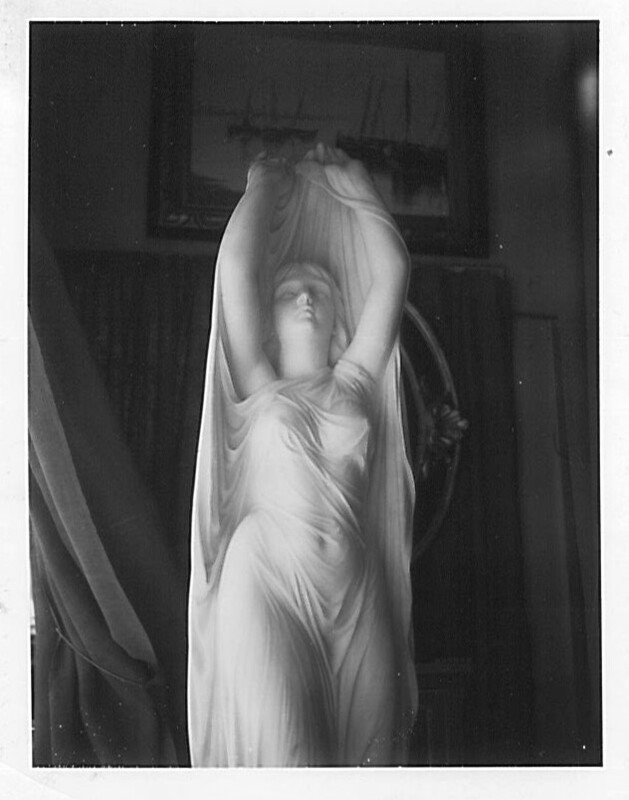 Photos of the Undine sculpture sculpted by Chauncey B. Ives. The Corcoran files consist mainly of published materials such as exhibition pamphlets, exhibition invitations, and articles. However, some of the most important materials in the files are of a primary source variety. Often times these materials provide insight that researchers haven’t discovered yet. One such item is in the file for the American sculptor Chauncey B. Ives. Born in Hamden, Connecticut in 1810, Ives was active mainly in Europe throughout the 19th Century. He was known for his Neo-classical style sculptures of prominent Americans, the most famous of which are his sculptures of Roger Sherman and Jonathan Trumbull which are within the National Statuary Hall Collection of the United Sates Capitol. Ives was also known for creating genre and mythological sculptures as well. 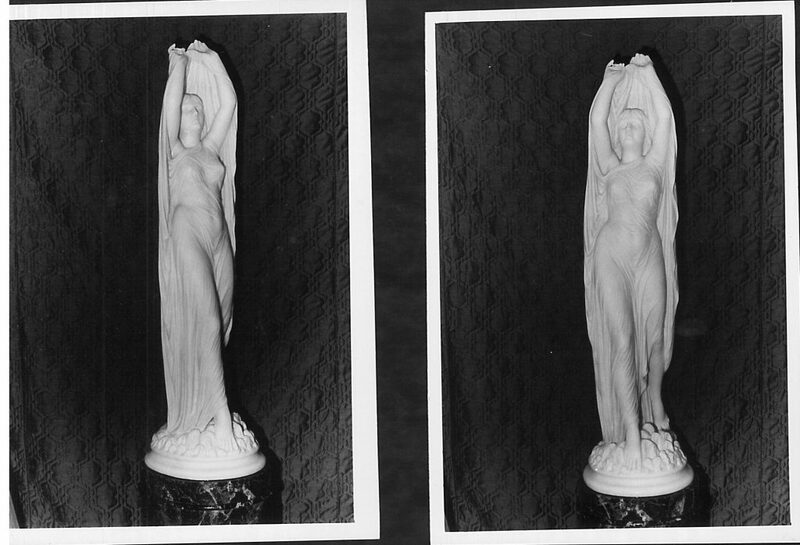 Two photos of Undine sculpture sculpted by Chauncey Ives. The Ives file contained quite a bit of correspondence between Corcoran staff and individuals who owned Ives sculptures. Some letters wished to know more about Ives or about the sculpture they owned and some offered to lend their piece for exhibition. It becomes clear that these letters provide some clues and context about the sculptures that Ives made, particularly because it was not unusual for sculptors to create copies of their particularly popular pieces. For instance, in one letter from 1966, an owner wrote to a curator describing the details of his Ives sculpture “Undine Receiving Her Soul,” including photos of the sculpture. He notes what he knows about the sculptor and even discusses how the duplication of statues does make collecting somewhat difficult and confusing. This was especially true for collectors who did not have the ease of communication that we have now. These details and the photos give us some history and provenance information about this particular sculpture. Other copies of this sculpture are in other collections including the Smithsonian American Art Museum which calls it simply “Udine.” The dimensions are different between the copies and can allow us to make some assumptions about the way that Ives produced his copies. 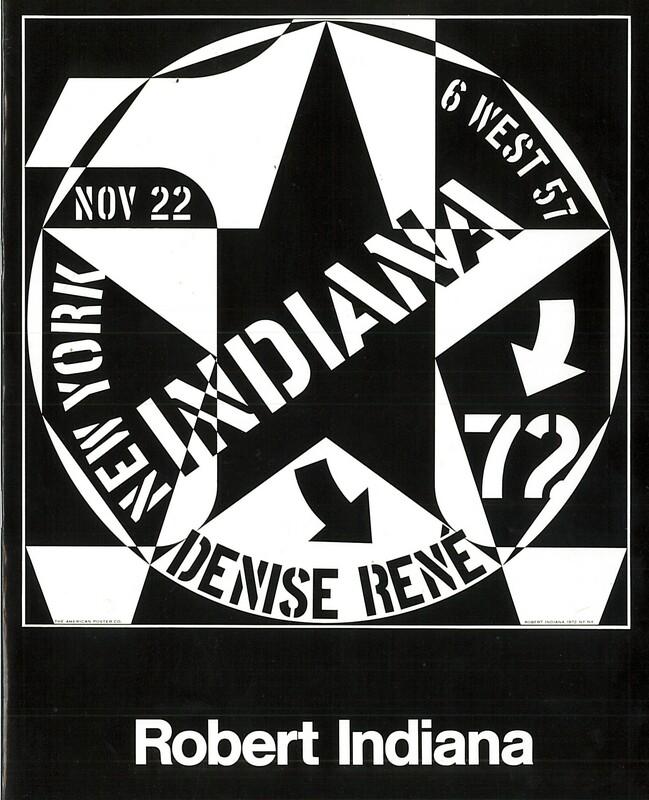 Cover of the catalogue of the Robert Indiana show at Galerie Denise René in New York from November to December 1972. The Corcoran file for American artist Robert Indiana, who passed earlier this year, also held some treasures. Robert Indiana, born Robert Clark on September 13th, 1928 in Indiana, is famous for his bold graphic style that utilized letters, numbers, and geometric shapes in bold colors. This style was best seen in his prints but some of his most famous pieces, such as his “LOVE” print, were reproduced and repurposed in many different mediums. Across the Smithsonian alone we have large sculptures, prints (this one commissioned for the opening of the Hirshhorn Museum and Sculpture Garden! ), handmade cards, and even a ring. Indiana was no stranger to the Corcoran, he had participated in several shows there and most likely had developed relationships with Corcoran staff over the years. 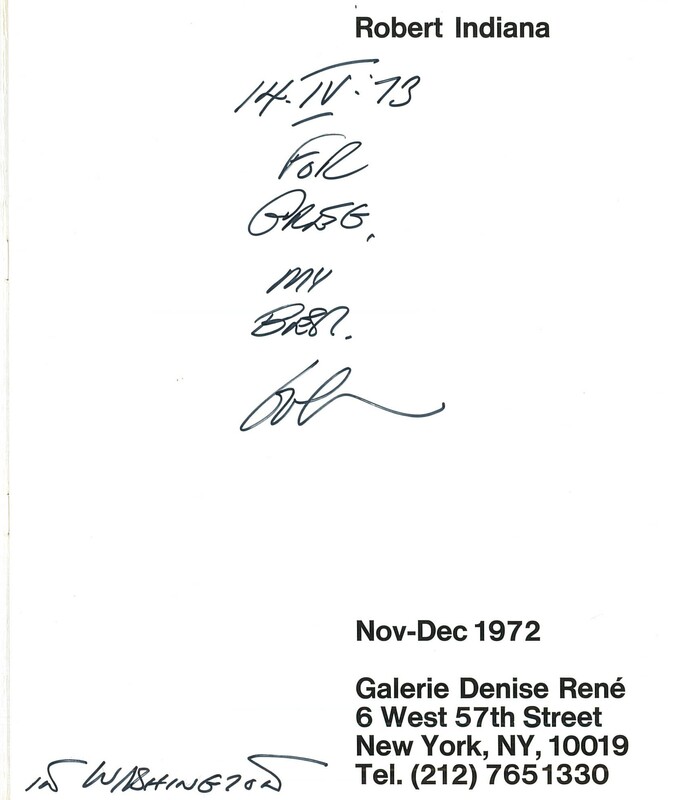 It comes as no surprise that the file for Indiana included a signed copy of the catalogue for a brief solo show he had at the Galerie Denise René in New York from November to December 1972. Indiana signed it to “Greg” on “14.IV.’73” with a familiar “bob” signature and noted at the bottom of the page “In Washington.” All of these details give us some insight into some quirks of Indiana’s signatures and notes but also clues as to where he was and who he knew at the time which can be helpful to researchers who are piecing together timelines of Indiana’s career.